Tucked in the middle of the Seminole Forest Neighborhood is Seminole Glen Park. The park is 15+ acres of diverse terrain composed of grassy/prairie areas, ponds and a 5-acre forested area. For years, the park has provided neighbors of all ages with opportunities for picnics, games, hiking or simply relaxing and watching the wildlife. But over time, the wooded area of the park has become overrun with invasive species of trees and bushes including honeysuckle and buckthorn. They’ve altered the composition of the forest and endangered native plant species. 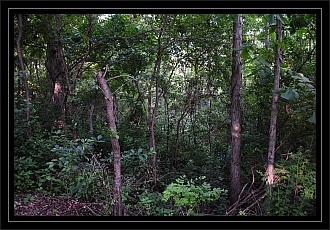 And with an understory so dense, the trails had become next to impossible to even find, let alone follow end to end. How did buckthorn get here anyway? European buckthorn was originally introduced to North America as an ornamental tree/shrub. It was planted as hedge rows in Wisconsin as early as 1849. And in the decades since its introduction, it has quietly naturalized and spread to all but 16 states in the US. In Wisconsin, it has spread to over most of the southern and eastern parts of the state. Buckthorn is an especially troublesome invader of natural oak savannas and oak woodlands in Wisconsin. Its successful spread throughout the US is attributed to a number of qualities in the plant. First, buckthorn produces a copious amount of seeds in the form of berries that grow on plants for up to 4 months. Those seeds can remain dormant in the soil for years before germinating. Then, in addition to a high germination rate, seedlings grow at a rapid rate and quickly form a dense, impenetrable understory. And finally, because of its tolerance of a wide range of soil and light conditions, it rapidly spreads through woods and savannas alike, adeptly pushing out native species. Buckthorn is considered a major threat to Wisconsin’s ecosystems. It out-competes our native species for light, moisture and nutrients. By preventing the natural growth of native tree seedlings, it is causing a long-term decline of our forests. Subsequently, forests overrun with buckthorn also experience a dramatic reduction in the diversity of song birds. With the disruption of the natural forest structure, nesting birds are more prone to predation in the lower canopy of buckthorns. Eradication of buckthorn and the restoration of native species require a multi-year effort. New buckthorn seedlings will continue to appear in cleared areas for years following removal of plants. And vigilance is required to prevent the return of buckthorn after the initial removal effort. But even the smallest native plants can bounce back if properly protected after being released from buckthorn competition. 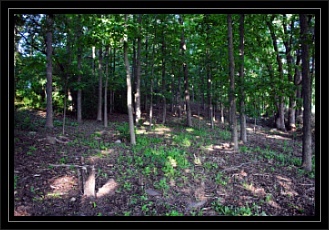 In October 2011, the Seminole Forest neighborhood initiated a restoration project for the wooded area of Seminole Glen. Working with the City of Fitchburg, Seminole Forest neighbors have volunteered their time and effort to help remove buckthorn from select areas of our forest. The SFNA would like to extend a huge thank you to those who have participated in the coordinated “Buckthorn Bonanzas”. We have already seen a significant transformation in the understory, and are delighted to begin reclaiming the walking paths in our forest. The park restoration is long-term project, and success will come from the determination and willingness of neighbors to put forth the needed effort. In the coming months and years, the SFNA will continue to coordinate buckthorn removal dates with the City of Fitchburg, and solicit neighborhood volunteers. Please consider joining your neighbors and volunteering at the next Buckthorn Bonanza. It doesn’t require any special knowledge or skills, just a willingness to jump in and help. And the payoff of knowing you’ve contributed to the restoration of our beautiful forest is well worth the price of a few sore muscles. For more information on our restoration effort, please feel free to contact the Director of Parks & Ponds.